Capping the gulf oil leak with plastic. The gulf oil leak seems to have beaten a multinational and a superpower so what chance do I have? The same chance as anyone else. A chance that depends on creativity and the fact that no one knows every thing but I may know something that they don't happen to know. I have nothing to loose. Could even make a buck or two. To cap the oil leak is technically possible but there's a catch. The initial explosive blast has shattered part of the well bore lining leading to a down the hole leak into the sea bed. The sea bed has porous strata that's allowing this oil to seep to the sea some distance from the well bore. Thus we have a flow from the BOP blow out Preventer (which didn't work) and a seep or seeps a few miles away. Its apparent that BP does not want to cap the BOP leak transfering the pressure elsewhere underground. That could trigger a geological event that may produce a tsunami or damage the relief well work. The first gulf oil cap. These methane hydrates dissolve back to gas at surface temperatures and pressures. They clog pipes like rubbish in a storm water line. The logical solution to this problem is to make a much larger diameter pipe up to depths where the hydrates can't form. Smaller pipes can be used from there. To make such a huge structure, hundreds of feet wide at the base and over a 5000 ft high we need to avoid steel or concrete. Both are too slow to fabricate. 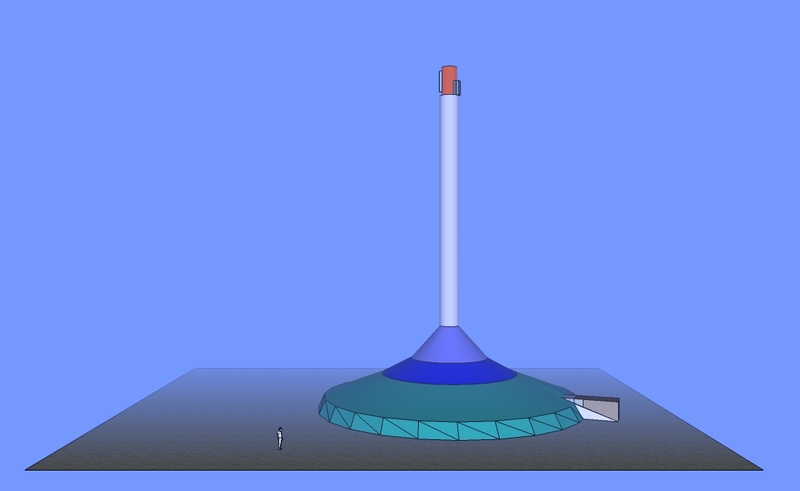 We need to make this structure out of plastic and cloth. Any rigid elements can be tubes of the same material pumped full of water. Its a giant tent. An under sea big top. 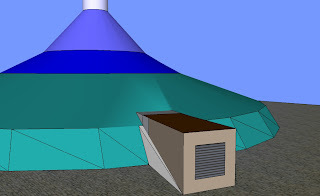 The oil and gas rises within the water under the conical dome and flows up into the pipe. No attempt is made to resist the pressure. None is needed. Its not the pressure that matters its controling the chemistry of the ocean that matters. The structure has a water lock to facilitate robots entry and exit. The canopy would facilitate umbilical power and communication with though the plastic powerlines and umbilical swapping. Wireless communications and induction charging or battery swap could be and should be used. 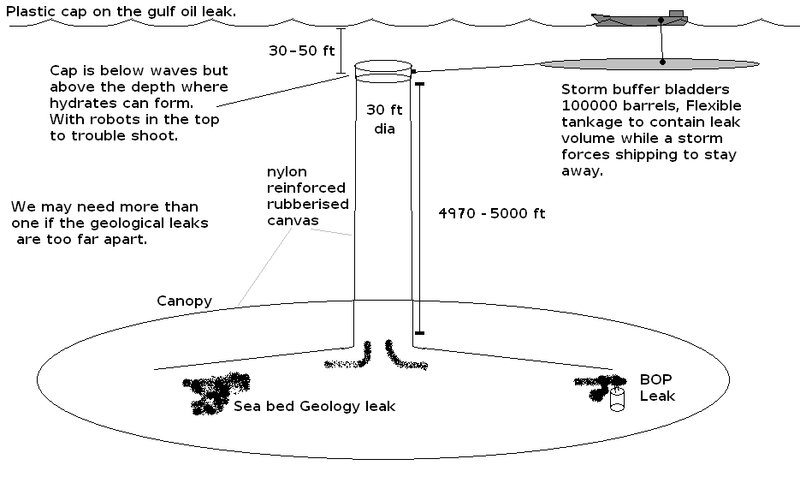 The robots anchor the structure down with dozens of screw anchors drilled into the sea bed under the dome and around it. Where currents are a problem additional anchors are places up current with a line linking them to the base and upper pipe. At the top we have a cap that's designed to handle methane hydrates while feeding the oil to multiple lines to tankers, centrifuge barges and gas flame off buoys. Click to enlarge visual summary. While there are ample available vessels there are two additional problems. If a hurricane barrels though the area all these ships will be forced to head for safety. We would not want to have to dump the oil because of the storm. There is a solution. Floating oil bladders like this one. 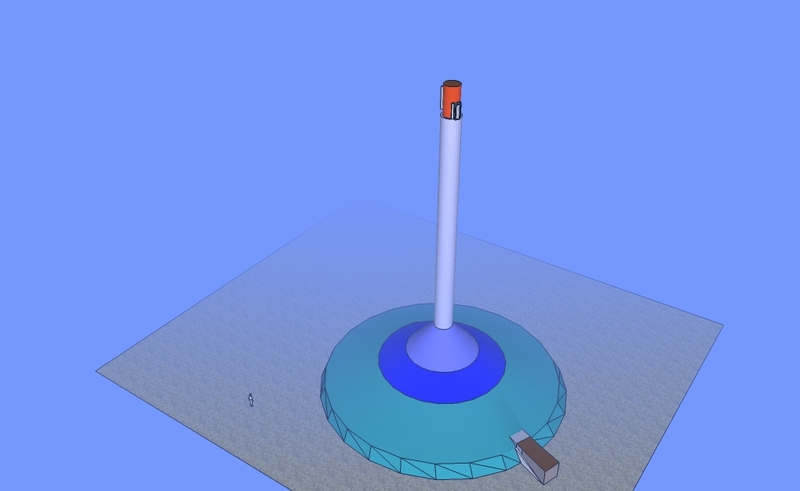 We need a dozen very big ones to hold the oil at the surface but at the same time contained and separate from the ocean. These should be quite storm and wave tolerant moving with the water not fighting it. They will need to be anchored with sea anchors and hard sea bed anchors. we could also use this technology to create a floating pipe several miles long to get the oil clear of the shipping and rigs. That bit of ocean is becoming difficult to navigate. It already needs a traffic control centre. These bladders can also help separate the oil from the water. By adding pipes to the bottom that hang down several meters and clarity sensors and pumps, water can be drained out the bottom of this contained oil slick. A clarity sensor is a LED and a photo-detector. 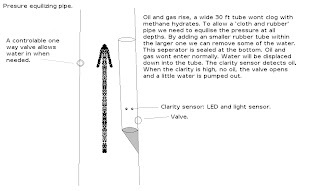 Oil obstructs this light and the valve shuts, when the water is reasonably clear the valve opens and the small pump runs. Air bubble may assist clarify the water in these pipes. The second challenge is pressure on the structure. This is why the oil men use steel. The ocean at these depths apply great forces on pressurised structures. The oil and gas apply forces of their own due to buoyancy, de-pressurising hydrates, chemical reactions with the sea water and drag effects. There is also entrained debris from the sea bed to deal with at the seeps. Allowing water in and out to equalise pressure will allow the structure to deploy. Water can be pumped in to fender the plastic and sacrificial canvas linings may help. Removing some of the water higher up the pipe will also help with the hydrate problem. The key is to control the oil flow not worry about de-watering until we're clear of the hydrates problem. One way valves and water pumps in the lower structure would equalise there. 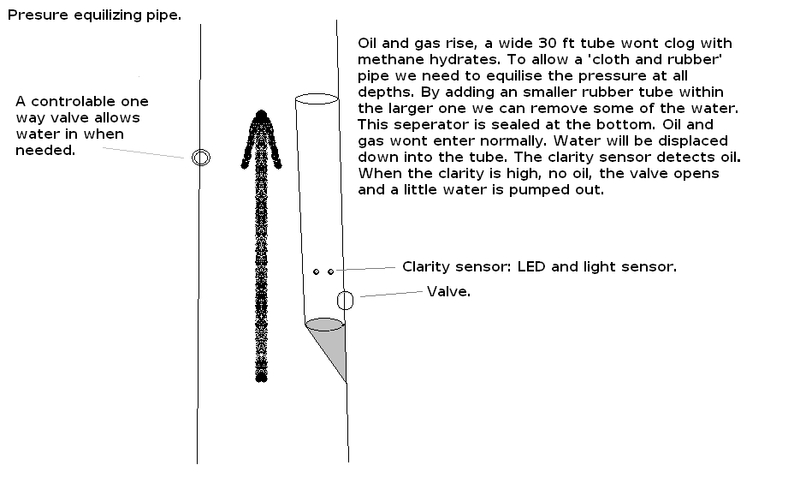 Higher up we would need an oil water separator integral to the wall of the big pipe. The oil and gas flow passes this structure; water is displaced downward. The two little dots are more clarity sensors activating the pump/valve. Lastly, This structure, particularly the canopy, can be constructed from modular patches of material and put together with a heavy volunteer input. Final assembly and folding is easy with thousands of volunteers hard with hundreds of cranes and complex jugs. Deployment should be done with fishing boats and barges and the big tent should be sized for the available vessels. There are several natural oil seeps that this technology may also work on. Someone needs to rally the necessary materials and resources to get these equi-pressure caps and bladder based contained slicks made and deployed. Lets get going on the underwater circus tents; the circus in Washington and London isn't getting us anywhere.